Flats are largely less prone to burglary than their single dwelling cousins and so present a safer alternative, but only as long as this feeling of security doesn’t lead into complacency. On the whole flats offer greater security against burglary than houses. In being less exposed than the average house, they present greater a dilemma and challenge to the average burglar. A big advantage to flats -at least those above the ground floor – is that the traditional intruder access points of the back door or the back window are no longer accessible, and the one entrance door is shielded behind a main building doorway. A flat also gives the resident a greater degree of anonymity, the reassurance of close neighbours, and is usually much simpler and cheaper to modify with security features. 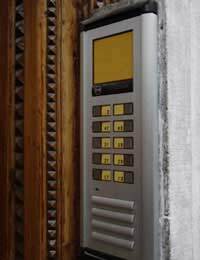 Intercom systems are a familiar feature in apartment housing blocks, and enable residents to control access of visitors to their building. Although the facility is designed primarily to aid effective admittance, it doubles up as a brilliant security system. Residents can communicate with their visitors without having to open their front door and speak to them face-to-face. This allows them to filter who is allowed into the building and up into their flat, all whilst maintaining a safe and secure distance. These electronic access control systems are most effective for a relatively small number of residences. The more residences there are, the harder it is for the occupants to be certain that all visitors into the block are legitimate. For blocks with 8 or more homes accessible via one common entrance, it is worth considering the installation of closed circuit television (CCTV) to monitor access. As flats have fewer access points than houses there is no excuse for not making them extra secure. As many flats are only accessible via their front door, it has a particularly large responsibility in keeping out intruders. As individual flat front doors are rarely as strong as those on houses, it is vital they are fitted with equally sturdy security protection, such as a good quality five-lever mortice deadlock (Kitemarked BS3621). To prevent the door being pulled off its hinges then inexpensive hinge bolts can be fitted to help reinforce the door’s joints. If the door itself is not very sturdy then consider replacing it with one at least 44mm thick. It is no use relying on the main building front door for security because its responsibility for keeping out undesirables is largely out of your hands. People all too easily ‘buzz’ open the door for strangers or hold the door open for people coming in out at the same time. It is easy to get complacent with security if you live high above street level but you’d be surprised how easy criminals can take advantage of this attitude. Never leave windows open when you are not at home; burglars have a keen eye for open windows and are not adverse to using a ladder, drainpipe or neighbouring flat to access it. Those flats on the ground floor get the rum deal as far as the security of their building is concerned. If a burglar decides they want to rob a flat within a housing block then it is much more likely they’ll opt for the more accessible ground floor residences. Basement flats are even more vulnerable because in being beneath street level they often provide burglars with greater concealment to go about their business. Basement and ground floor residents can at least feel safer in the knowledge that they are the best positioned for escape in the case of a fire emergency.